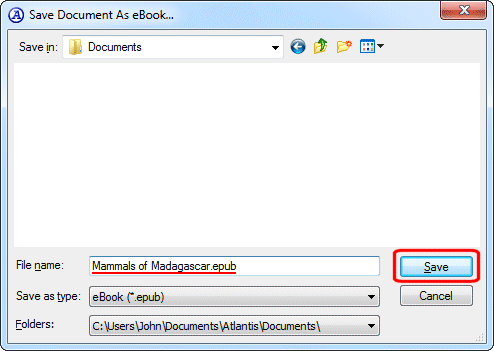 Any document that you open or create in Atlantis can be saved as eBook. Atlantis saves eBooks in the EPUB format. It is supported by most eBook reader software and devices (including Sony Reader, Nook, and iPad). Atlantis can also optionally generate eBooks in the Amazon Kindle (MOBI) format. All eBooks created in Atlantis can be viewed on your computer in desktop eReaders. They can also be viewed on portable devices supporting eBooks in the EPUB format. You can create eBooks in Atlantis for personal or professional use. You can upload your eBooks to various Web libraries to share with the community. You can sell your eBooks. Etc. Open the eBook template from the Stories folder. Atlantis will automatically create a new document with the template contents, i.e. the sample contents of a basic eBook. Press CtrlS to save the newly-created document. Give an appropriate name to that document. All you need to do then is to adapt the newly created document to suit your purpose. You can change the original sample text, add new text, chapters, pictures, etc. As any paper book has a cover, eBooks can have covers, too. A cover image can be created in any graphic software, and saved to your system as a graphic file. 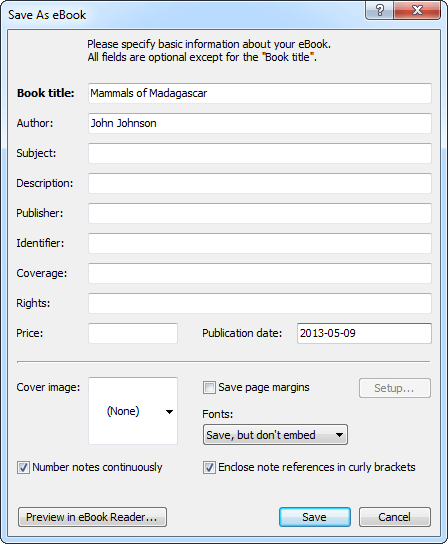 command, then use the "Cover image" box of the "Save as eBook" dialog to add a cover image. Note that the most typical size for cover images is 600 x 800 pixels. 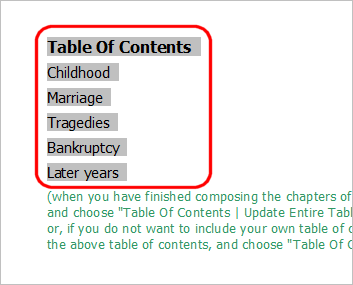 This stand-alone table of contents displays within the navigation pane or as a separate popup window in eReaders. It can be used to quickly navigate between the eBook's chapters. In Atlantis, a document can be divided into chapters by inserting any appropriate heading text before each chapter, and then formatting the heading text with a dedicated Heading 1 style. To create a multi-level (hierarchic) chapter structure in your document, apply a Heading 1 style to the main parts or chapters of your books, apply a Heading 2 style to the sub-headings, and a Heading 3 style to the headings that are even lower in rank in the heading hierarchy. When Atlantis saves a document as eBook, it automatically picks up all the headings (paragraphs formatted with the "Heading" styles) from the document to generate a stand-alone table of contents. Note that the inline tables of contents are mandatory in Kindle eBooks. So if you are planning to convert your document to a Kindle eBook, you must include an inline table of contents in the source document. Chapter headings struck out in the source document will not be included in the eBook's main text. By default, any picture from a source document displays in eBook readers with its original size. But there are eReaders with different screen sizes. Big pictures might display cropped or not display at all on eReaders with smaller screen sizes. If you plan to use big pictures in your eBooks (pictures whose size is comparable to the document page size), it is preferable to format them in a special way. Just double-click a "big" picture in your document, and check the "Zoom to fit page" box. The picture will be automatically resized to occupy the entire screen page when viewed in eReaders. Do not use pictures with width or height greater than 1000 pixels. Older eReaders or eReaders with limited hardware resources might have difficulties displaying them. Accordingly, use a graphic editor (Adobe Photoshop, Paintshop, GIMP, etc) to resample any such big picture. Also use the right graphic format for pictures. The JPEG format is good for photographs or complex images with vivid colors. The PNG format is good for all other pictures. You can format your book contents in any desired way. But note that eBook readers do not support all the formatting options available in Atlantis. So before publishing your eBook, it is recommended that you test it first. If you have inserted footnotes or endnotes in your document, they will automatically be placed at the end of the corresponding eBook. 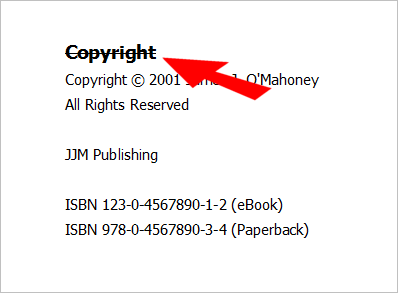 So you should not expect that a particular note will be displayed in an eBook on the same page as its reference mark. When the "Save page margins" box is unchecked, Atlantis saves no information about page margins to eBook. eReaders will display the eBook with their default page margins. When the "Save page margins" box is checked, you can click the "Setup..." button to specify page margins for your eBook. "Save, but don't embed" is the default option. When it is selected, all the font formatting found in the source document is saved to the eBook, but none of the corresponding font files get embedded into the eBook file. Let's take an example. If a source document contains a paragraph formatted with the "Times New Roman" font, the eBook file will include an instruction to eReaders that they should use the "Times New Roman" font to display the corresponding paragraph of the eBook. If the "Times New Roman" font is available in the eReader, it will use it to display that paragraph. Otherwise, the eReader will use a substitution font. When the "Save and embed" option is selected, all the font formatting from the source document is reflected in the eBook code, and the font files used in the source document are also included in the eBook file. In this way, all the font files required to display the eBook as faithfully to the original document as possible are available within the eBook file. eReaders supporting font embedding can then use the embedded fonts to display the eBook. Font embedding does make eBook files much bigger, but it is an absolute must with documents containing texts in non-Western European languages. Many eReaders do not have fonts to display Cyrillic or Far-East Asian texts. 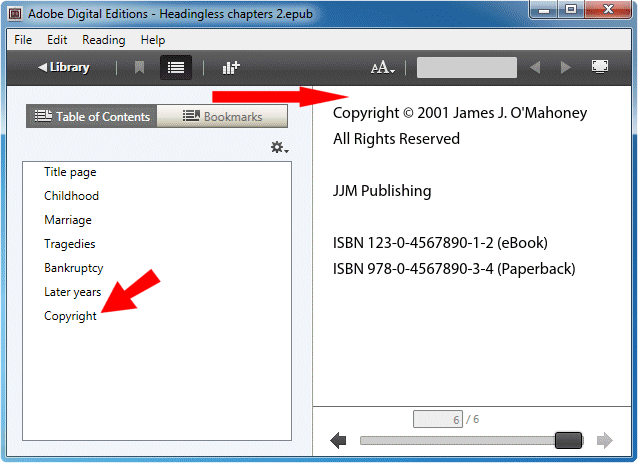 By embedding the required fonts in an eBook file, it is possible to make eReaders display the eBook correctly. Note that when "Save and embed" is selected, an "Exceptions..." button becomes available. You can click this button to specify which fonts you do not want to be embedded in the eBook. For example, you might wish not to embed common fonts like "Arial" or "Times New Roman" which most likely have similar equivalents available on eReaders. When the "Don't save" option is selected, Atlantis saves absolutely no information about the fonts used in the source document to the eBook file. And obviously, no font file is embedded in the eBook either. As a consequence, the eReaders will automatically display such eBooks with their own default font. This option is preferable when the source document is formatted with a single font, or when you want the eReaders to display your eBooks with their own "default" settings. Some eReaders offer a choice of fonts for the display of eBooks. On such eReaders, an eBook generated with the "Don't save" (fonts) option in Atlantis will always display with the font chosen within the eReader. When "Number notes continuously" is checked, Atlantis ignores the numbering format used for the notes in the source document, and uses sequential numbering for the corresponding notes in the eBook. Notes are not natively supported in EPUB eBooks. So continuous note numbering in eBooks is only natural because all the document notes are shifted together as ordinary text to the end of the eBooks. Notes in eBooks do not appear on the same pages as they appear in the corresponding source documents, so the original note numbering of the source documents rarely makes sense. However, in some cases, the original note numbering format of a source document might need to be preserved in the corresponding eBook. You will uncheck the "Number notes continuously" option for this purpose. When the "Enclose note references in curly brackets" option is checked, Atlantis puts an extra pair of brackets around the note reference marks to make them wider, and thus more easily tappable on eReader screens. Before pressing the "Save" button to store the file on your hard disk, you might want to preview the eBook in the associated reader if available on your Windows system. If none is available yet, you can always download Adobe Digital Editions for free, and install it on your PC. 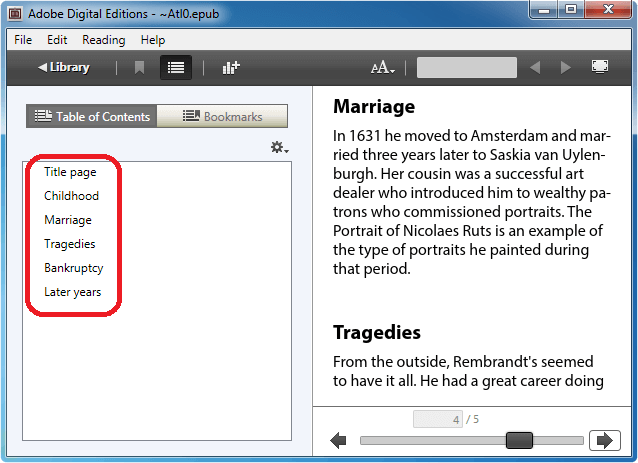 Note that the Batch conversion feature of Atlantis can be used to convert multiple existing documents to the EPUB format. Download the kindlegen utility from Amazon. 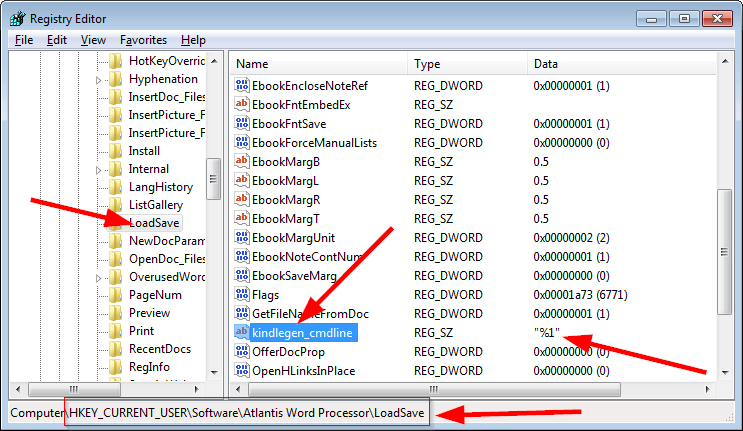 Extract the "kindlegen.exe" file from the downloaded kindlegen ZIP file to the home folder of Atlantis on your system (normally "C:\Program Files\Atlantis" or "C:\Program Files (x86)\Atlantis"), or to the "My documents\Atlantis" folder. After this, Atlantis will not only create the corresponding EPUB file, but also a Kindle version of it, i.e. a file with the ".mobi" extension. If your source document contains an inline table of contents, Atlantis will save your document as eBook with all the information required by the Kindle devices to locate the eBook's table of contents. When a Kindle eBook is created through Atlantis, the first chapter of the eBook is automatically marked as its "Beginning". And the "Go to... > Beginning" command of the Kindle will bring you to the first chapter of the eBook. This is normally done without user intervention. Atlantis automatically decides which locations in the source document correspond to its "table of contents" and "beginning". All you need to do is to create actual content in the source document, i.e. add chapters and generate the corresponding inline table of contents with the dedicated command of Atlantis ("Insert | Table Of Contents..."). In this way, you could tell Kindle that the "beginning" of your eBook is not "Chapter 1" but the title page, or the prologue, etc. Important note: you should close all the running copies of Atlantis (if any) before editing the Atlantis settings in the Windows Registry. When you have converted a document to the EPUB format, it is a good idea to test the resulting .epub file in as many eBook readers as possible. For this, use any available devices like iPad, Sony Reader, etc. You can also install Adobe Digital Editions, a free eBook reader, on your Windows system. eBooks in the Kindle format can be tested with Kindle Previewer. When you have successfully tested your eBooks in such a way, you can upload them to the available online eBook libraries, or publish them in any other way. Note that any EPUB file generated by Atlantis passes through the EPUB validation test. If you need assistance with creating eBooks, please contact us. We would be happy to help.